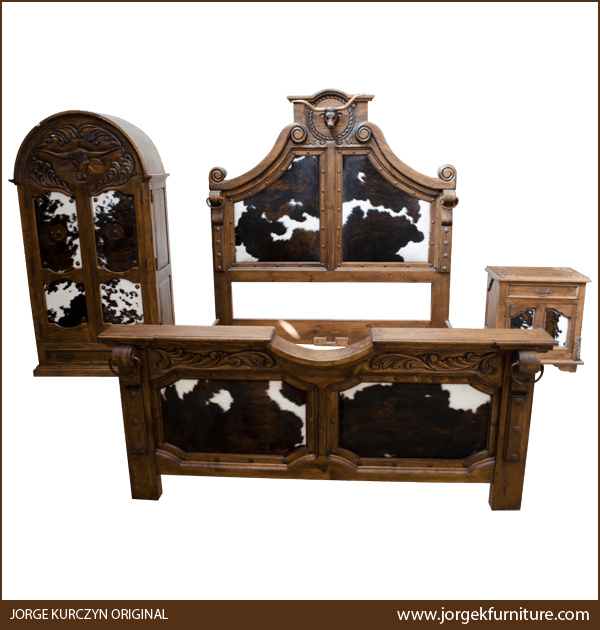 If you love Western décor like we do, then combine this marvelous, handcrafted, Western style armoire with our Cowboy bed (bed34), Cowboy bench (bch31g), and our Cowboy mirror (acc40). The front of the armoire features two, large, rectangular doors, and each door is embellished with two, geometric shaped, vertical panels. Each panel is covered with patterned, real cowhide, and there is a hand forged, iron concho in each corner of each panel. In the center of each upper panel is a hand forged, iron concho with a pull ring. Below the doors is a narrow, solid wood drawer, with two, hand forged, iron handles on its front. 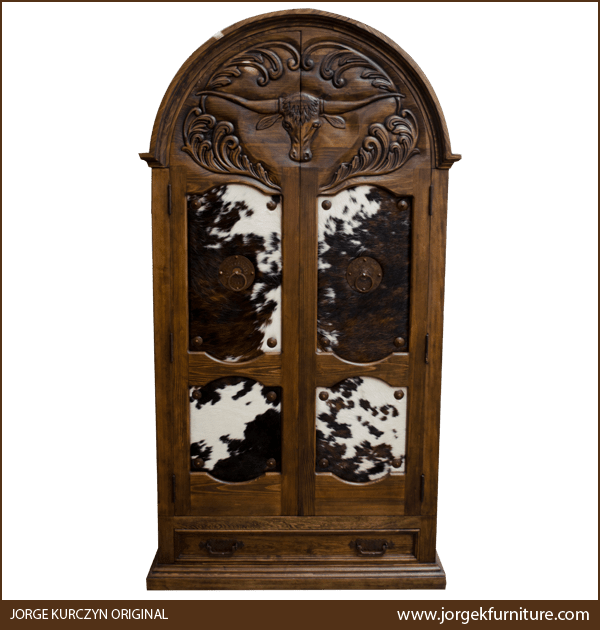 The armoire has a semi-circular top, and centered in the top is a marvelous, hand carved, steer head with horns. 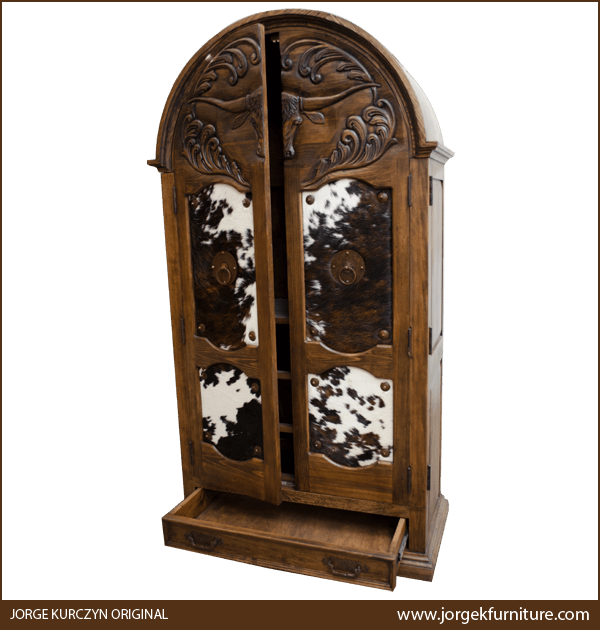 Surrounding the steer head are graceful, hand carved, floral and scroll details, and the lateral sides of the armoire are adorned with rectangular cut panels. Inside the two doors is a large space that can be customized with diverse, shelving and drawer designs. 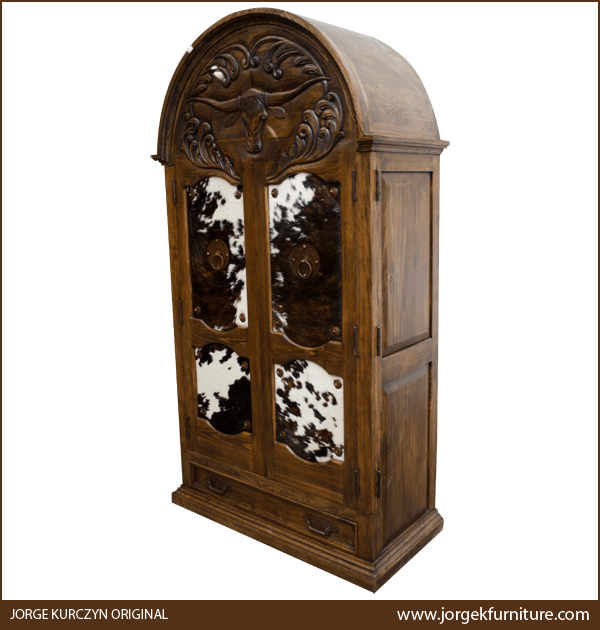 The armoire has an antique finish, and it rest on a solid wood, molding base. It is made with the best, sustainable, solid wood available, and it is 100% customizable.